Fever Alarm sounds when temperature exceeds 37.5 C Recalls last temperature reading Beeps to indicate ready to use and when peak temperature is reached 60 seconds display Includes instructions, battery and storage case Two Year Warranty .. This flexible tipped thermometer is designed with accuracy, comfort and ease of use in mind. This compact lightweight thermometer is ideal for home use. Features Soft, flexible tip for safer measuring 60 second reading (Measurement time will vary by individual and method used) For Oral, Underarm or Rectal use Beeps when measurement complete Last temperature reading memory Water-resistant sensor Auto power off °C / °F conversion .. This rigid tipped thermometer is designed with accuracy, comfort and ease of use in mind. This compact lightweight thermometer is ideal for home use. .. Features Clinically Validated to BHS highest grade (A/A) Slim-fit comfortable cuff Irregular Heartbeat Feature WHO Blood Pressure Classification indicator Uses 1 x AA battery 1 x AA battery and full instructions included ..
Pulse oximeter for determination of oxygen saturation and heart rate pulse • 10 adjustable brightness levels • 6 different view displays • Automatic switch-off after 8 seconds • Battery level indicator • Representation of values on dual-color OLED display • With carrying strap • Oxygen saturation and pulse can be displayed in bar graph or waveform .. The UA-704 has an innovative "Palm Top" style that makes monitoring your blood pressure easy. The ergonomically designed monitor fits in your palm so you can start your BP measurement easily. Its great portability enables you to carry this unit anywhere to monitor at anytime. .. 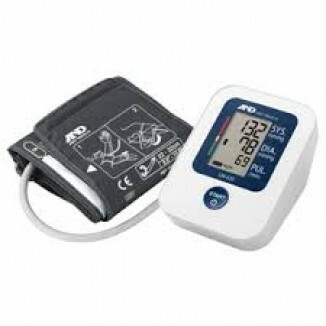 This upper arm automatic blood pressure monitor is the latest in a long line of quality measurement instruments from A&D Medical. This excellent value monitor, combines all of the qualities normally associated with A&D products - Clinical validation, excellent features, simple and stylish design - but at recession busting price. The monitor is supplied with a latex and metal free cuff, and runs on 4 x "AA" batteries (included). .. Body analysis scale with high-quality ITO electrodes The body analysis scale BS 440 connect does more than simply weigh - it analyses that most important factors indicating bodily fitness, such as body fat, amount of body water, and muscle mass. And it does so in the very best way. Because of their high quality, the ITO electrodes are ultrathin with a vacuum-metalized surface. As a result, they can hardly be seen or felt. The BS 440 connect not only delivers measurements for up to eight users and shows them on the large backlit display, but can also transmit them by Bluetooth® to the Vi.. The UW-101 are equipped with a 3-axis accelerometer, which detects motion in all directions. This technology allows them to accurately track your steps, even if you put them in your pocket or bag! The UW-series encourages you to keep walking, a simple aerobic exercise that you can do every day to improve your health. ..
With our pulse oximeters PM 100 and PM 150 connect one measures one‘s arterial oxygen Saturation (Sp02) and heart rate (pulse) for reliable self-monitoring at home or on the road. The application of pulse oximetry ranges from sports in low-oxygen altitude to health care control and the care of patients suffering from heart or lung diseases. If the body periphery is not provided with enough oxygen, it threatens to overload the cardiovascular system. With its Bluetooth® Smart interface, the data can be transferred from the PM 150 to all compatible devices, stored and s..